Andy Rutledge | Eagle Gun Range Inc. I am what many people would call a dangerous man. This is because since 1988 I have trained 3 to 7 days a week, as other responsible men do, in the arts, sciences, and techniques of maiming and killing men. The popular and appropriate term is self-defense, because few are comfortable with the fact that self-defense requires you train to be very good at maiming and killing men. This is what it means to be a responsibly prepared man: to be prepared for violence. This is what I train to understand and to do. As such, I am a member of an endangered, beleaguered, and therefore shrinking group. According to our cultural and political masters, my being this sort of responsible man makes me a threat to society. More specifically, it makes me a threat to the society our cultural and political masters are desperately working to create. And mostly they are succeeding. Like other responsible men, I train weekly and have proficiency in using environment, observation, behaviors, and tools to gain advantage. Like other responsible men, I train weekly and have proficiency in using unarmed techniques and weapons, including knives, swords, sticks, pistols, and long guns, to incapacitate and destroy the spirit and body parts of those who would threaten me, my family, or my property. 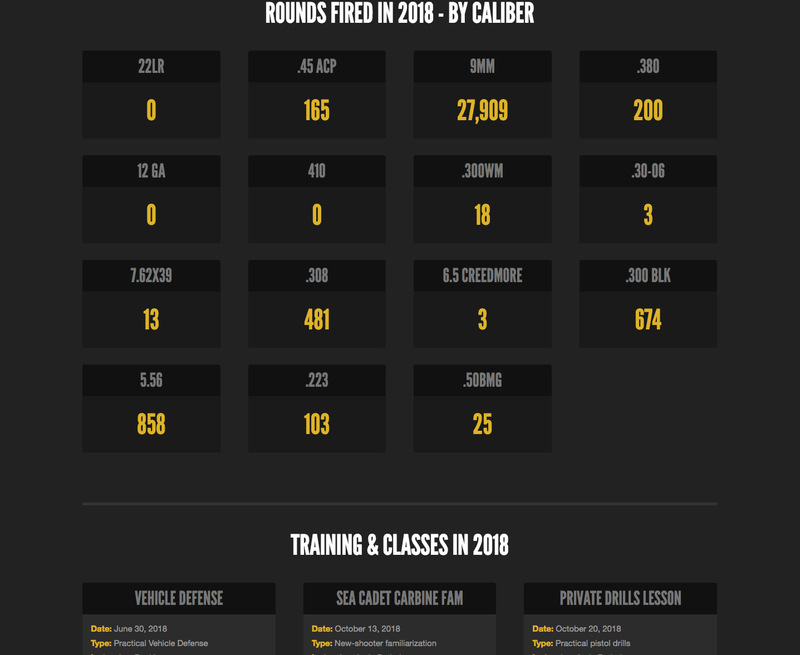 I fire roughly 30,000 rounds every year in training and competition in order to maintain my proficiency. Despite these facts and what leftists otherwise claim, no one in my vicinity is ever under any threat from me unless they choose to threaten or act to harm me or harm others within my mantle of protection. In short, the people in my proximity are far safer than most other people specifically because of their proximity to me. Even so, the pop-culture leaders of our deteriorating culture now deliberately and erroneously classify me and others like me as a threat to society. You may find this difficult to believe, but there was a time when society did not exclude responsible people. But those days are waning. Our cultural and political masters often repeat the provably false cliché: “Violence never solves anything.” An education will make remarkably clear that, indeed, violence is the only thing that ever has. Diplomacy is the art of destruction by incremental compromise. Violence or the promise of assured destructive finality is the only thing that has ever ended a conflict. Despite what your cultural and political masters will tell you, violence is not objectively bad. It is, like every other tool, morally neutral. It is a means to an end and, exclusively, the moral prerogative of the defender. As with any other tool, it is the circumstance of the employment of violence, measured against objective morality, that defines its quality; a fact both sheep and tyrants ignore in order to hasten the embrace of tyranny. Because I train and occasionally mention it, sometimes my habits become known by those I interact with and I am often asked if I “know how to fight.” I do not. In the context that those asking imagine it, a fight is either 1) a lie, or 2) a case of something frivolous treated as serious and then carried out irresponsibly and incompetently. Fighting is for irresponsible men; it’s a laughable circus for ill-tempered bubbas, thugs, and hooligans devoted to indulging emotional fetish. They fight to create spectacle or build irresponsible legend. They fight because they lack self-control and morality and because they relish harming others…and they fight to ensure that others know these things. Indeed, they fight to project an ungoverned threat of irresponsibility. Responsibly prepared men don’t know how to fight and spend no time trying to learn. Fighting is dangerous, foolish, and pointless and a misemployment of violence. Violence is for finality, not frivolity. Violence is terrible and no responsible man ever wants to employ it. Men trained in and prepared for violence don’t fight; we only know how to maim and kill—or—how to immediately and decisively end a physical threat without violence, because the purpose of violence is destructive finality. In a situation where destructive finality is not the proper outcome, violence has no moral purpose and its employment is irresponsible. As a dangerous man, I am also just a simple designer. For eight to ten hours a day I employ my God-given talents and hard-won skills as a designer and business strategist. The rest of my waking hours, outside of a bit of leisure, are devoted to my family and to responsible preparation as a good, dangerous man. I want and need to be a dangerous man, in part, because I am a husband and a father. Just like being responsibly prepared for violence, being a husband and a father makes me a member of another endangered, beleaguered, and shrinking group. According to our cultural and political masters, my filial and marital fidelity makes me a threat to the society leftists are working to create. They seek to supplant me and other responsible husbands and fathers with an all-caring, all-knowing, all-controlling government. This is the sort of outrageous idea that takes hold when a society ostracizes good, dangerous men and demagogues their very existence. Despite these tyrannical efforts and irresponsible ideas swelling in American culture, there are other good, dangerous men around you. 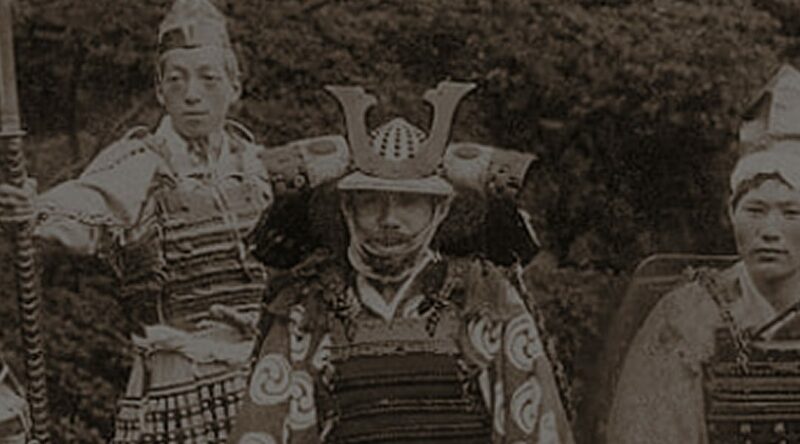 They maintain our important traditions and hold to objective morality and they keep us safe when mortal threats arise. They also serve you coffee, pick up your trash, calculate your taxes, fix your plumbing, design your websites, teach your children, write the books you enjoy, and run the companies that employ you and your friends. But not a single one of them is a Democrat, Socialist, Communist, or other statist. Objective morality is anathema to statists and their ideology doesn’t allow for good, dangerous men to exist. As such, they are the actual threats to society. The existence of responsibly dangerous men is culturally and legally threatened and curtailed by a now-continual and rampant encroachment of tyranny. This tyranny is buoyed and enabled by willful ignorance and by the systematic destruction of morality and important, once-sacred traditions. Because of this leftist-designed destruction of morality and American culture, liberty is dying. For everyone. By design. American culture and liberty are under threat. Our nation needs more good, dangerous men. Our nation needs more people who embody the antithesis of the leftists who seek to destroy our liberty and our culture. If you’re a moral man, you have a solemn responsibility to be a good, dangerous man. You have a solemn responsibility to learn to defend yourself and others. You have a solemn responsibility to train to decisively and abruptly end threats to your life, your family, and your property. To do so means you must possess the ability to maim and kill men. You must also have the capacity to stop a threat decisively, without violence; something impossible without dangerous, destructive capability. This responsible preparation means ongoing training. It is not something you can devote a few days, weeks, or years to and then have done with. If you once prepared and now wait in supposed preparation, claiming to be prepared, you are deluding yourself and others. If you are not training regularly you are not prepared and your claim is an embarrassing lie. Training is preparation. All else is fantasy. Fantasy is the opiate that those working to destroy our liberty and our culture are handing out like candy. Fantasy is what they rely on; that, and the elimination of good, dangerous men. Don’t buy into utopian fantasy. Choose responsibility. Become responsibly prepared. For when the good, dangerous men are gone, liberty and The United States of America will be gone. 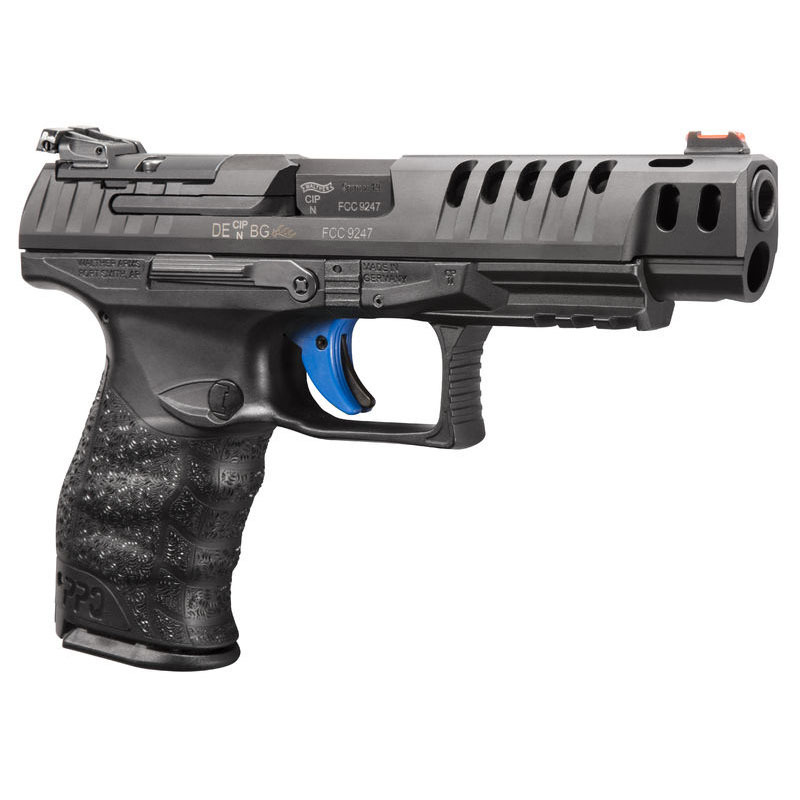 Built around Walther’s PPQ platform, according to the manufacturer, the Q5 Match “is built for the production class competitive shooter.” While I’m a competitive shooter, I stay in the stock/production divisions and appreciate out-of-the-box qualities on pistols that lend themselves to fast and accurate running. Guns of that ilk that come to mind include the CZ Shadow at the high end, Canik tp9sfx on the affordable side, and now Walther has thrown its hat into the ring, somewhere in the middle. I was introduced to the Q5 Match early this month at an event at Eagle Gun Range. While speaking with the factory representative there he asked if I had seen the pistol (I had not) and he put it into my hands. It certainly looked like a performance machine and with a few dry presses I enjoyed the feel of the trigger action. I was anxious to try it out and Eagle’s general manager assured me I would soon get the chance. So I’m happy to say that this month I’ve spent some time shooting the Q5 Match and I’m eager to share my first impressions of Walther’s new pistol. 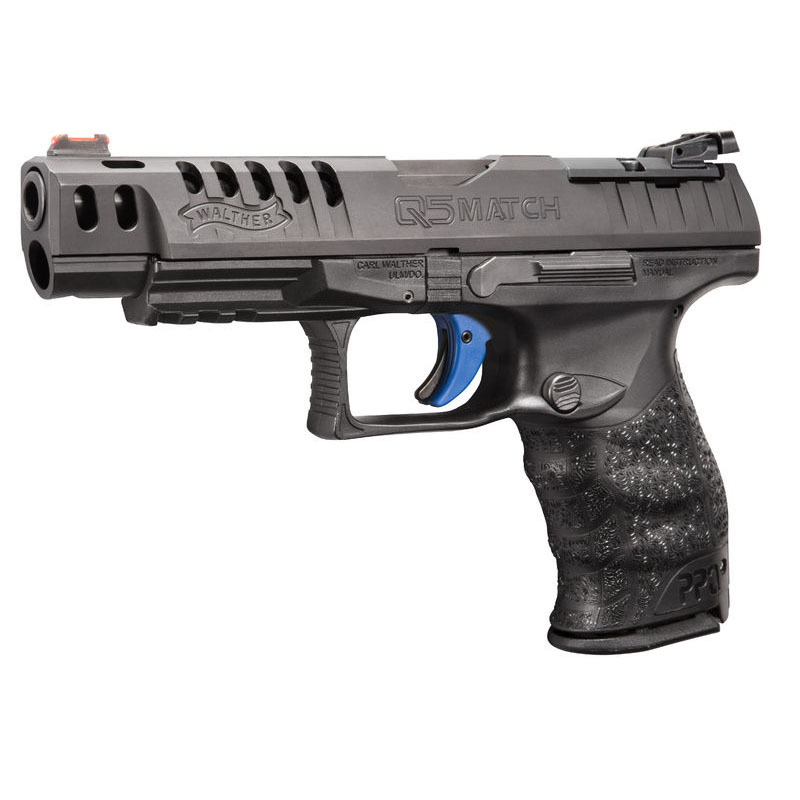 Why Consider the Walther Q5 Match? The Q5 Match is specifically made for competitive shooting. It comes with three sizes of grip backstraps for proper fit to your hand. The comparatively long sight radius makes for easier accuracy and the slide cuts and ports removes weight, reducing the recoil impulse. It comes with and is ready to accept various red-dot optic mounts and the blue Q5 trigger is exceptionally smooth with a relatively short press travel (0.4”) and very short reset (0.1”). The result is a very shootable and accurate system right out of the box. Since Walther went to the trouble to make it immediately ready for various red-dot optics, this is a pistol to consider specifically if you plan to run it with one. Since adding a red dot to a pistol that was not built for that setup can introduce function anomalies, it makes sense to instead get a model made for it. Lastly, you might consider the Q5 Match if you’re looking for a great value and you’ve got a fairly hefty budget, since its MSRP is $849. But again, this is not your average, compact carry gun; it’s a racer with some excellent competition-specific features which more than justify the cost. One enjoyable constant of shooting just about any Walther pistol is the grip ergonomics. They just feel good in the primary hand; at least I’ve always thought so. I got to spend a couple of weeks with the Q5 Match and my hands enjoyed every minute of it. Well, my support hand not quite as much, but I’ll get to that in a minute. Mostly, though, shooting the Walther Q5 Match was an absolute pleasure. The first shooting I did with the pistol was on 1” dots. Even when shooting at a good pace—about four shots in 2 seconds—I was able to maintain quarter-sized groups of four at 7 yards and if I slowed down to 4 shots in 3 seconds I could put all 4 rounds in the same hole with relative ease. I’ve never shot a pistol that was so easy to maintain accuracy with medium-paced shot strings. Part of the reason for this easy accuracy has to be the excellent trigger. It’s smooth and relatively short, but that extra quick reset is fantastic and really allows for some “quiet” hands when shooting. I love this trigger. I noticed pretty quickly that the pistol’s muzzle was moving around more than I’m used to seeing with each shot. The long slide extends further away from my hands than with most pistols I shoot, so I was unaccustomed to that much muzzle flip. Even with the slide cuts and ports, which did reduce the felt recoil, I thought, the end of the gun was moving far more freely than with more compact pistols. One of the reasons for this muzzle flip is the fact that the Q5 Match lacks any sort of index point for the support-hand thumb. I tend to ding lots of pistols for having straight, slick sides and no shelf to allow the support-hand thumb to mitigate muzzle flip, but on a purpose-built competition gun like this, I think it’s a pretty big flaw. The sins of that flaw showed up when I started shooting the Q5 Match the way it was intended to be shot. I setup a target with 4 fist-sized circles at 7 yards and did runs of eight shots: quick pairs in each of the four circles, doing the full circuit in about 2 seconds. My lack of practice with a longer slide and the lack of a forward thumb shelf combined to make it very difficult for me to maintain accuracy with each pair. I wanted to go fast—I’m rather practiced at fast shooting strings—but I had great difficulty controlling the muzzle flip. As a result I never got the hang of the timing and grip management required to keep that second shot of each pair in close enough proximity to the first, for my taste. I have to believe this is merely a training issue for a new gun with different dimensions than I’m used to, but I confess I was quite frustrated. This is a race gun and it seemed a bit clumsy while racing. That issue aside, I found the pistol to be a pleasure to shoot. The model I used had only the iron sights, but I would really like to shoot this one with an RMR mounted. Seems to me that it’d be something close to an unfair advantage on a gun that’s already so easy with accuracy. Running the gun for mag ejection, reloading, and using the slide release (something I don’t habitually do) was all very smooth and comfortable. Walther has done a pretty fantastic job with this pistol. The Q5 Match has Walther’s famous ergonomic grip geometry that just seems to feel better in the hand than most pistols on the market. That fact coupled with one of the three included backstraps means you can likely create just the right fit to your hand. While some pistols beg for a bit of frame modification for better comfort (*cough* Glock), my hands were perfectly comfy on the Q5. My impression of the recoil impulse was that it was no worse than any full-size, 9mm, polymer pistol; perhaps lighter than most. What I did have a bit of an issue with, however, was muzzle flip. The long slide on this gun means that there’s more real estate moving around and more weight that is farther away from your hands as compared to a compact pistol. The result, even with the removed slide weight with the cuts and ports, was quite a bit more movement than I’m used to. Somewhat surprising, I think, is the fact that the Q5 Match has something of a meager capacity, at 15 rounds in the magazine. So while the slide length is 8.1” and longer than that of a Glock 17, the capacity is the same as a “compact” Glock 19. I’d have thought that for a competition-specific pistol that they’d go for a larger grip and capacity. The magazine capacity can be augmented, of course, with extended slide plates, but I still wonder why Walther chose to go with 15 as the stock capacity. If I were to nitpick, I’d say this is perhaps the second flaw in this package. As mentioned before, the Q5 Match’s grip is remarkably comfortable and configurable with small, medium, and large backstraps. The grip texture, however, is somewhat lacking in my opinion. 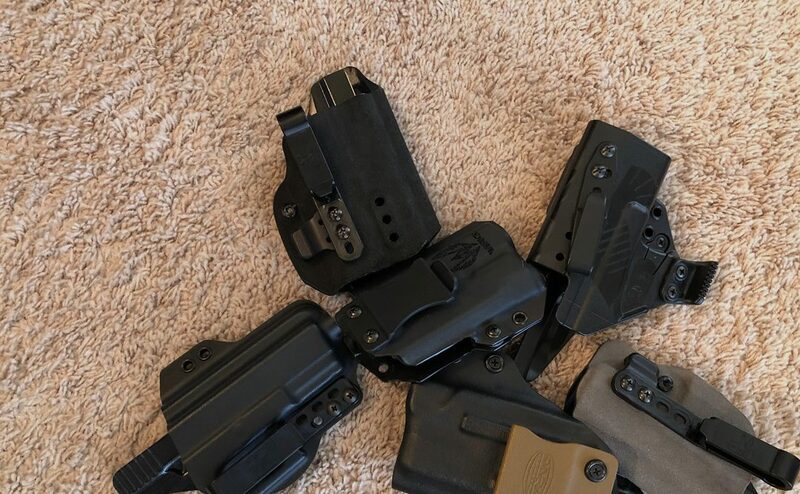 The “quick defense trigger” is fantastic and even though it is not exceedingly light at 5.5 pounds, I’d be happy with this on any of my pistols. Walther says the press has 0.4” and the reset 0.1” of travel. Well done! The controls are also very nicely done. The slide stop/release is oversized for length, but still keeps a low profile on the side of the frame. 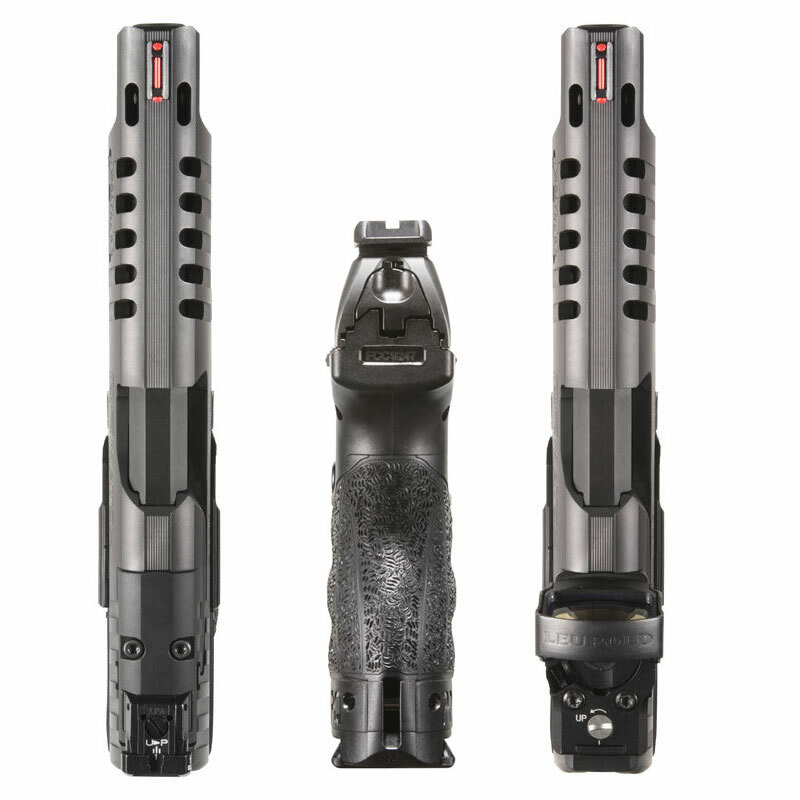 The configuration is perfect for staying out the way when you’re shooting and easy to access without breaking your grip when you want to actuate it. There are slide stop/release levers on both sides of the gun. The magazine release button is round and, again, unobtrusive, but I found it easy to access when I needed it. It is reversible so that lefties can have that option. 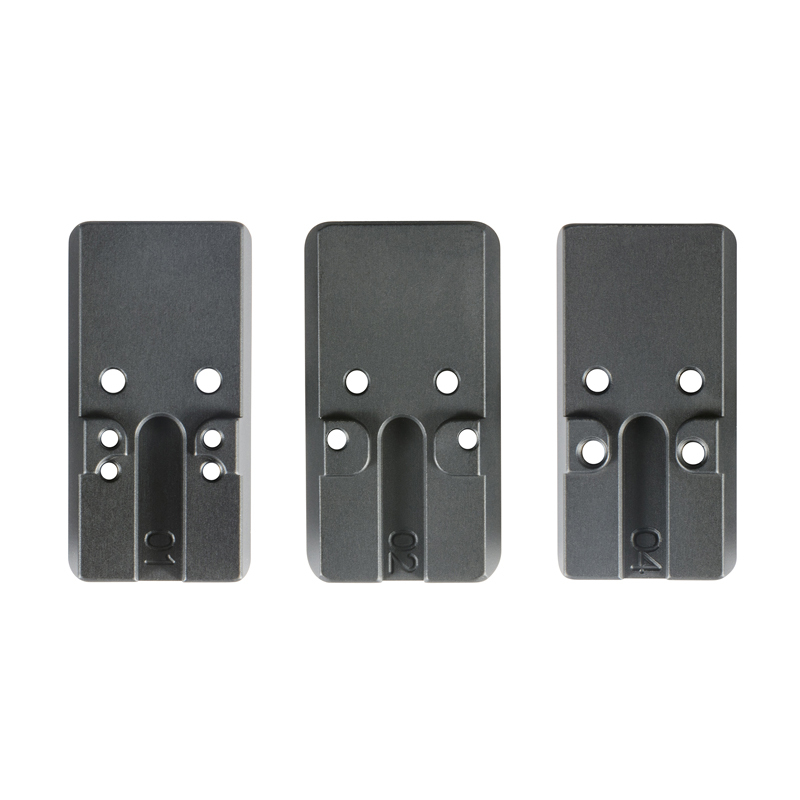 The included red-dot mounting plates are made specifically to fit either Trijicon, Leupold, or Docter red-dot optics. That Walther included all three in the box is pretty awesome, I think. The pistol comes with three (!) 15-round steel magazines (or 10-rounders in more tyrannical states). The Q5 Match is a formidable production competition gun right out of the box, with its ported-for-reduced-weight slide, long sight radius, and fully adjustable iron sights. Even better with the multi-red-dot-optic options. With the right backstrap, the Q5 should fit just about anyone’s hand like a glove. Lastly, the trigger is one of the best you’ll find on any striker-fired pistol. The Q5 Match has a comparatively low capacity for a competition gun and some folks may balk at the price. Moreover, it should have some sort of forward thumb rest built into the frame. The Q5 Match is among the most comfortable pistols around. This is an eminently shootable pistol with all sorts of characteristics that make accuracy easy, but it could use some design features to assist with fast shooting. I find the Q5 Match to be among the most accurate pistols I’ve ever shot. Even with the $849 MSRP, the features and out-of-the-box adaptability and included peripherals for this pistol make it quite a good value. 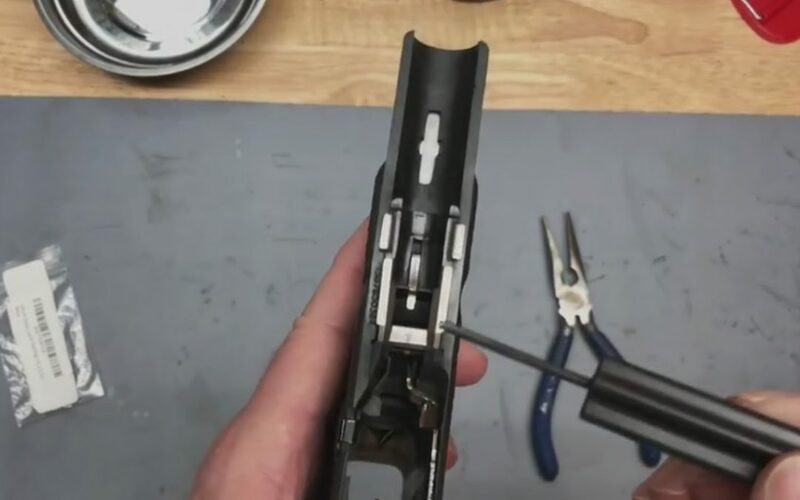 There are a lot of companies who do good slide modification work, but the cost of doing what Walther has already done here would be prohibitive and one would end up paying far more this one costs from the factory. 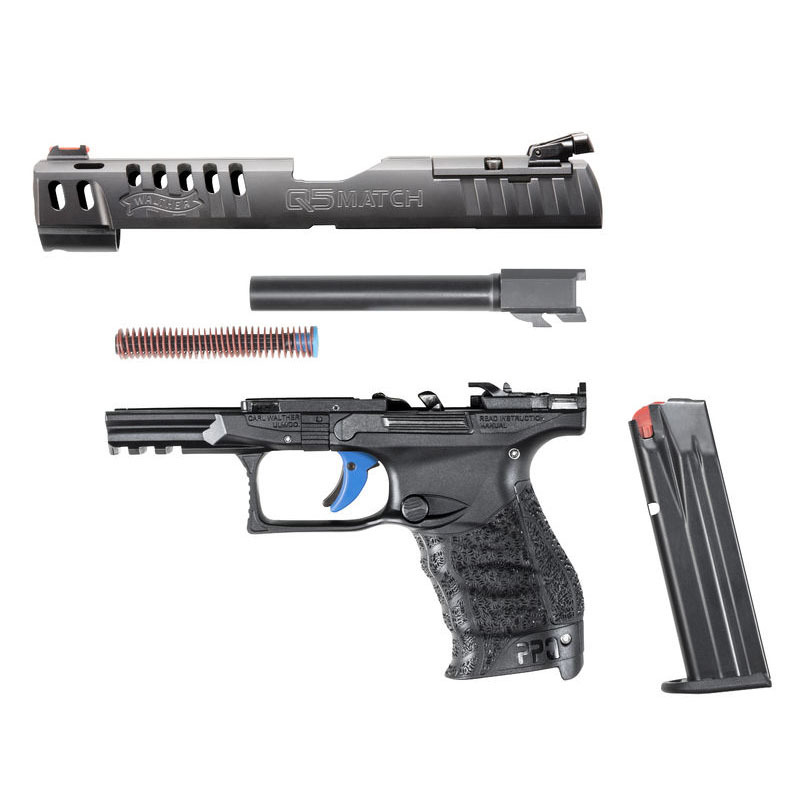 If you’re looking for an advantage in the production division of your competitive matches—and/or—if you’re looking to build an optic-equipped race gun, I think you could do a lot worse than the Walther Q5 Match. This may be about the best value available as a starting platform for your competitive machine. Yes, there are better models available, but at something close to twice the price. I recommend that you give the Q5 Match a try. I’m guessing you’ll fall in love with the grip comfort, controls design, and the excellent trigger, as I have. You can rent it here at Eagle Gun Range, so give it a shot or two and see what you think. I’m betting you’ll dig it. I replace the slide-lock spring every 10,000 rounds. If you wait too long, this part will break in half and your slide will fall off of the frame when it fails. 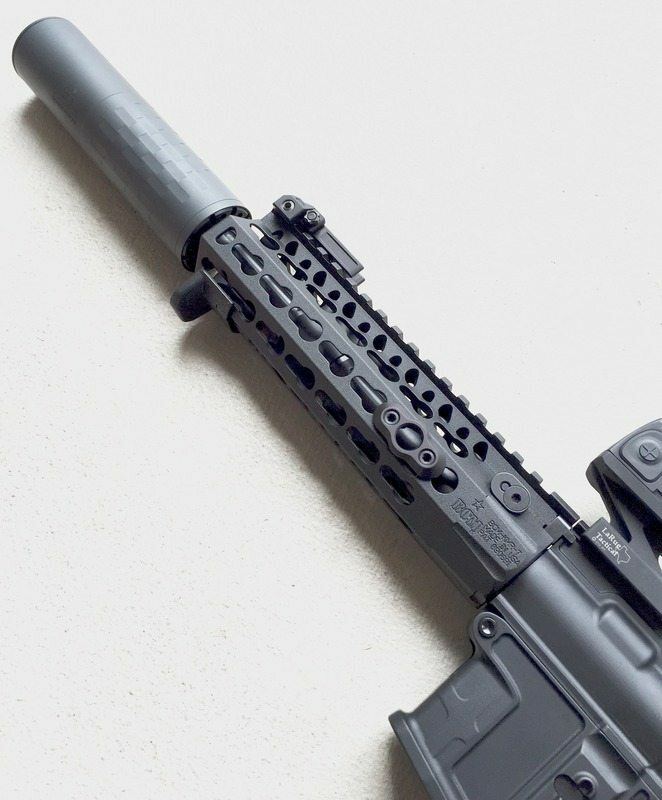 Best to just spend $8 every 10K rounds and keep your gun in perfect running order, as a part of required, periodic maintenance rather than suffer a complete stoppage at an inconvenient time. Keep good records so that you know when to replace various components! But anyway, here’s how to do this one replacement on any Gen 1 thru 4 Glock pistol.